Stupid Aliens gives you 45 seconds to grab as many Aliens as you can to get big combos and high scores to get to the top of the Leaderboards. Five unique locations with unique music tracks for each! Play five different game modes! Hit Quick Play, and after a 3-2-1 countdown, the 45-second timer beings as 3 Aliens race into view. A large Blue Alien, a medium-sized Red Alien, and a small Green Alien! Each time you tap an Alien, you get points and another of the same color spawns! Keep tapping Aliens to increase your Combo to get massive scores! Be careful, though! Missing the Aliens by tapping anywhere else on the sky makes the Aliens TAKE points from you AND it will reset your Combo! Just the Green Mode is a super challenging mode where only the small, and super fast green Aliens are on the screen. This mode introduces FIVE Aliens to grab making it possible for some huge scores, assuming you can keep the combos! Tapping this will blow up all Aliens that are on the screen giving you all of their points AND earning a 3x COMBO! One more thing…the Aliens get faster as time goes by! Good luck and happy Alien Hunting! Simple to play, difficult to master! Challenge your friends and family today! Stupid Aliens is a quick-access game, allowing you to play a quick 45-second round or spend the whole night getting all of the achievements. 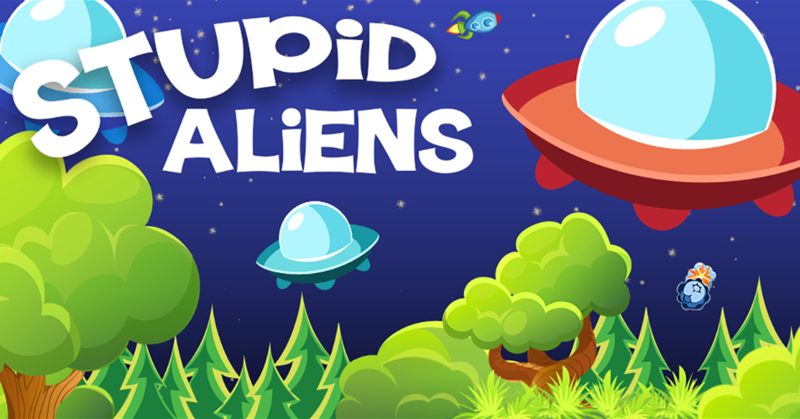 Download Stupid Aliens on iPhone or Android now! Follow me on Twitter, Facebook, Reddit and subscribe to my YouTube channel for regular updates and news about Stupid Aliens and new games in progress!